Hoya lithophytica is an extremely slow growing, limestone loving Hoya from Doi Hoa Mot, Umphang, Tak province , Thailand. The following was copied from an online Russian Hoya Catalog: The leaves are small, leathery, oval with pointed tip, 2.0-3.5 cm long, 0.9-2.2 cm wide. The upper surface of the leaves dark green, smooth; lower surface pale green with sparse hairs on the main vein and on the edge. Midrib convex bottom, slightly concave top. Side implicit veins 7-10 pairs, nearly at right angles to the main vein.Petiole cylindrical, 0.4-1.0 cm long, 0.15-0.20 cm in diameter, pubescent. The flowers of Hoya lithophytica are virtually identical to the flowers of H. wightii ssp palniensis except for points on the coronal lobes, but that is where the similarities end. The blooms of H. wightii have a powerful intoxicating scent; the blooms of Hoya lithophytica have no detectable smell. Hoya lithophytica is a small extremely slow grower, and H. wightii grows rampantly and gets very large. Below you will find a thumbnail sized photo of the flowers of H. wightii so that you may see just how similar the flowers really are. I bought a very small Hoya lithophytica cutting in the spring of 2013 not knowing anything about the plant other than I had never heard of it. It pretty much sat there for months without growing. Finally in a warm grow tent it started to slowly grow during the winter. Instead of growing up like most Hoyas, its stiff little vine grew straight down. I had to keep raising the pot so that it would not grow into the screen that cover the trays of water in my tents. Finally I gave up and put it into a hanging pot as it only wanted to grow straight down. There is quite a long saga of all of my ups and downs with the plant over a 3 year period before I was able to coax flowers out of it. If you want to read all of it, I suggest you search for it in the Ramblings Blog section of this website where I wrote about it in September of 2016. The short story is that I finally turned the plant around using natural sunlight and adding crushed seashells to the potting mix. 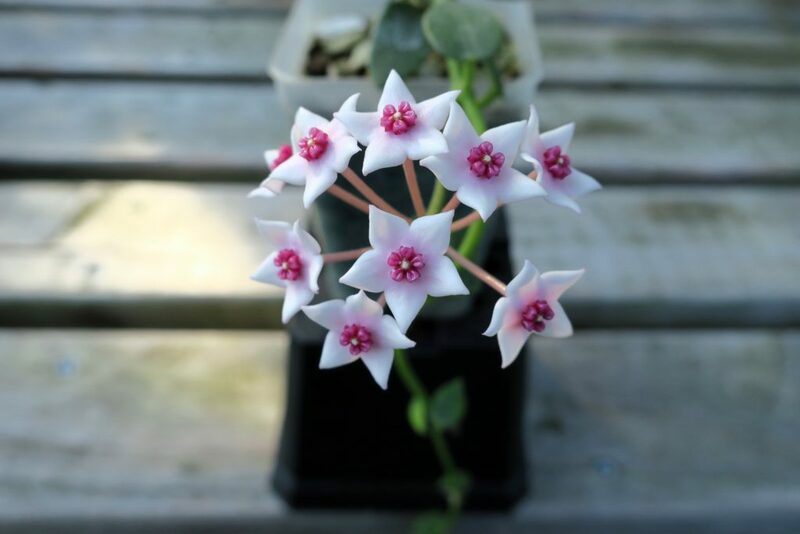 If you have the patience, this is a great little Hoya to add to the collection – one that you will never have to worry about taking up too much space!